You have found the perfect wedding dress, but are not sure what length necklace goes best with the neckline? You will rarely go wrong with the versatile 14 to 16 inch choker-length bridal necklace, but other lengths do not pair as well with all necklines. Try different options, but bear in mind that you want to leave a gap between the necklace and the neckline of the dress. On the other hand, if your gown is simple, it is fine to wear a strand of pearls or necklace that hangs below the neckline. – A high neckline may not need a necklace. If you choose to wear one, a 12 to 13 inch collar, 14 to 16 inch choker, or 17 to 19 inch princess length looks best. – A low, off-the-shoulder, or plunging neckline that exposes a lot of skin looks well with many lengths, from a collar to princess length. 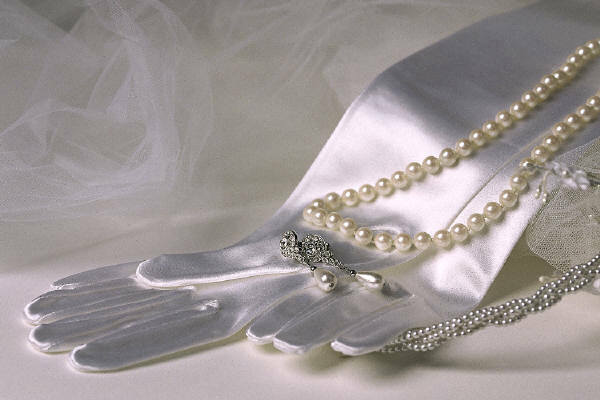 The bolder bride may prefer a 40 inch rope-length strand of pearls. – V-neck gowns are most balanced with a collar-type necklace.